It’s no secret that Jackie Chan is without a doubt my favorite martial arts action star. In my book it’s Bruce, Jackie, Gordon, and everyone else., but JC has always been tops for me. It’s amazing how he’s defied what he should be able to do at his age and keeps on trucking. I was as excited as anyone else when a new Police Story was announced. Much like Chinese Zodiac, Jackie returns to one of the series that made him famous. This new film is called Police Story, but contains none of the fun of any entry in the series, including New Police Story. 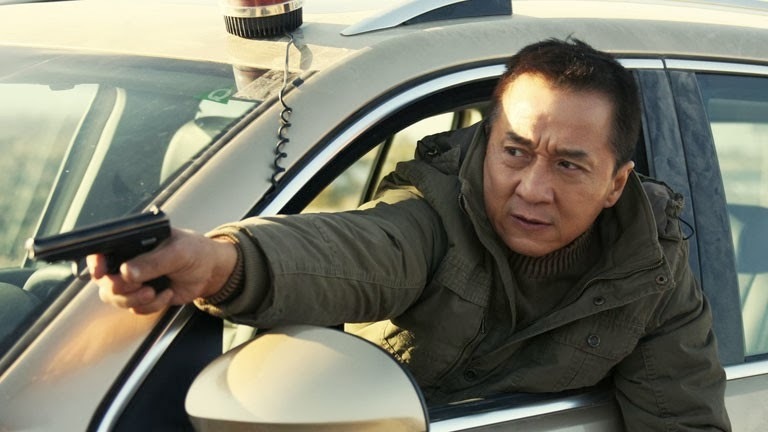 The story of Police Story: Lockdown moves at a pace that is odd. Many of the action scenes are actually told in flashback, which is infuriating to say the least, because in Jackie Chan films, the situation is immediate and of the moment, and the flashbacks are a story mechanic that is woefully out of place for a Jackie Chan Police Story film (New Police Story did a flashback, but it came at the end of the film and was an appropriate way to close the story). Jackie Chan is a very serious and dour character, and this doesn’t change from the start of the film through the end. Jackie plays the character well, but it just wasn’t fun. Liu Ye is great as Wu Jiang, and the emotional rollercoaster ride he takes during the film is believable right until the end, where he becomes an Evil Bad Guy. Jing Tian is good in her scenes with Jackie Chan as his daughter, but her part is still a damsel in distress role, which is just played out at this point. Ding Sheng directs the film as if he didn’t know this was a Police Story film. While some of his shots are really gorgeous, some are confusing, particularly a few action moments. I pretty much expect that from Jackie’s American output, but not from his Chinese language films. The fight scenes are…ok. Nothing special, which is a cardinal sin for this series. Even New Police Story had the great fight vs Andy On. Here the fights are not shot very well, and what’s there is very, very small. Is this due to Chan’s advanced age? I don’t think so, not in the light of what he does in Chinese Zodiac. They try to take a more realistic approach to the fights, but that’s no fun, not for a series called Police Story. Of course that can be said for just about every moment of this film. Jackie Chan is in need of a snickers bar, ’cause he’s not himself, nor is this a true Police Story Film. If he decides to close the series out, it needs to be with Kevin (Ka Kui) Chan, in a film with a better balance of comedy and action. Actually a lot more comedy, and Maggie Cheung.